You're our best resource for referrals. And we'd like to reward you for them. Refer a friend & earn a cash referral gift! 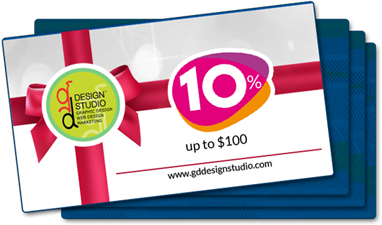 No one knows the benefits of working with GD Design Studio better than you, our clients, which is why we're asking you to send friends in need of web or graphic design our way. That's why we created the GDDS Referral Program. With every approved referral you submit, you can earn 10%, up to $100, off your referral's initial job with us. It's a great way to help friends and family - and give your revenue a little boost! *Individual is considered an approved referral once initial deposit is received.